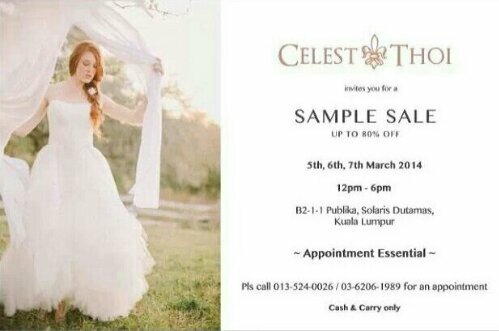 Happenings @ Celest Thoi: Sample Sale! 1. Are you in the process of sourcing for gowns, shoes, or other wedding-related apparel? 2. Are you free on the 5th, 6th or 7th of March? 3. Have you been having the inexplicable urge to drive up to Publika, Solaris Dutamas of late? If you have answered yes to all (or even any) of these questions, well, you’re clearly looking to drop by our showroom for Celest Thoi’s Sample Sale! So, do give me a buzz to set up an appointment, and bring your friends along as well!